You have been dreaming about this day all your life. You know exactly what you want and have your wedding venue, bridal attire, photobooth rental, wedding DJ, lighting services, etc. Where does your limo fit into the process? Don’t forget to get feedback on the various companies out there. The driver you deal with the day of your reception can affect your overall experience. Just think if you were to arrive late how that would affect the rest of your day. Situations like these are unpreventable, however you can reduce your chances by selecting the right limo service. One of the items on your agenda is how many people will fit in the limo. It is a good rule of thumb to have a list of the people in your bridal party. 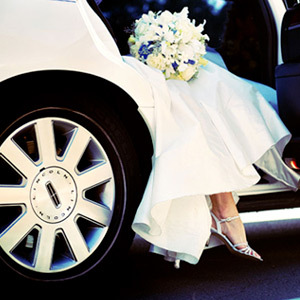 You don’t want to cram the vehicle too much, because you will need extra space for your gown. Also, let’s not forget your bridesmaids dresses. You want to over estimate the size to make sure you have breathing room in your limo. Also your videographer and photographer might want to ride with you in the limo. They will be able to capture all the media in-between locations inside your limo. Go to some bridal shows or ask around for limo vendors. If you do a quick search online you will find a handful of Michigan limo companies. As much as the Yellowpages are getting outdated it can also be a good source. Once you have a few vendors in mind it is time to start narrowing down the list. Give their office a call and ask some screening questions over the telephone. If they have your wedding date open, it’s now time to stop by their showroom to demo their fleet. You might a very distinct preference, so if the vendor only has one make or model they might not be able to help you. The variety in limos covers everything from Hummers and Vipers to Chargers and Lincolns. Another reason you would want to avoid a company that has a limited amount of vehicles is because those limos will usually have the most wear and tear. They will have a higher probability of breaking down the day of your wedding. What is the standard for etiquette? What is the standard uniform policy? Does the driver have a good understanding of your wedding reception area? Try not to go by GPS solely. Sometimes technology will not work due to a lack of signal strength in certain areas. If the driver isn’t skilled on city layout you might want to avoid them. What is their fee for the rental? Get a breakdown of the limo costs upfront. Some places will charge by the hour, others do more of a flat rate. Find out if your date is eligible for any discount incentives. Limo companies are always known for trying to book last minute dates and slower weekends. If you reserve multiple days, they might give you a better package. Commonly discounted days are Sundays and off peak rental hours. If you are having a early reception then this would work perfectly for you. Once you have your eyes set on a company, it’s time to look over the contract. If you have any hesitations take a day to think over your decision. No professional should pressure you into booking. You will want to go over all the package details to make sure everything discussed is included. Make sure the vehicle make and description is notated in your package. What are their cancellation terms? In order to reserve the limo for your date there will be some type of monetary commitment involved. Also followup with your vendor before the big day to ensure everything goes smoothly. To plan a wedding involves a lot of details. Everything has to go your way and it will if you pay attention to tips from other professionals. Limos are a fun way to move about on your big day, but problems with these companies can lead to big headaches down the road. Prevent these issues and pay attention to the company the answers all your questions. If you found this article on Michigan Wedding Limousines helpful, then please leave your comments below. Once again congratulations on your celebration. Please also ask to see their Insurance Certificate to make sure they are operating with insurance. There are companies out there that do not! If they are hesitant on showing you this simple form then forget them and move on!